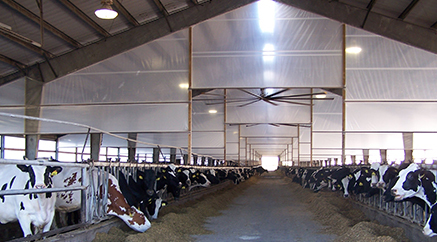 Livestock Curtains - Livestock Roll Up Covers | Reef Industries, Inc. Your livestock are valuable, so protect them from the elements with Griffolyn® livestock curtains. Griffolyn® materials are high quality and high performance polyethylene laminates that are internally scrim reinforced to provide high performance and long-lasting service. Griffolyn® covers are UV stabilized and provide extreme tear and puncture resistance for durability in demanding environments. They are cold-crack resistant and moisture resistant. No matter how large or small, Griffolyn® livestock curtains can be fabricated to your exact specifications. 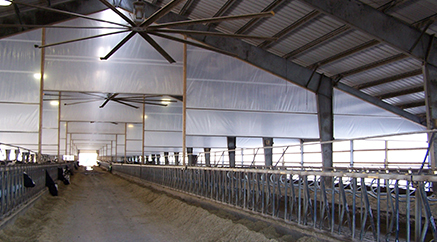 Griffolyn® livestock curtains are versatile and cost effective. Protect your livestock; specify Griffolyn®. Griffolyn® can also provide you with high quality hay covers. Griffolyn® Type-85 is a 5-ply laminate combining three layers of high density polyethylene and two high-strength cord grids. It is specifically engineered to provide high strength and durability in a lightweight material. Griffolyn® Type-90 is made with 2 layers of white film and one layer of black film with 2 layers of reinforcement. It is specifically engineered to provide high strength and durability in a lightweight material. Griffolyn® Type-90 FR is a 5-ply laminate combining three layers of fire retardant, linear low density polyethylene and two high-strength cord grids. It is specifically engineered to provide high strength and durability in a lightweight material. Griffolyn® Type-105 is a 7-ply laminate combining four layers of high density polyethylene and three high-strength cord grids. It is specifically engineered to provide high strength and durability in a lightweight material. Griffolyn® TX-1200 FR is a 3-ply laminate combining two layers of linear low density polyethylene and a high-strength cord grid. It is specifically engineered to provide high strength and durability in a lightweight material. Griffolyn® TX-1600 is a 3 ply laminate combining 2 layers of U.V. stabilized coextruded polyethylene and a high strength cord grid. It is specifically engineered to provide high strength and durability in a lightweight material.